How can the knowledge of researchers, policy-makers, and local communities be combined effectively to address the challenges of climate change? This column outlines the potential of citizen-powered “knowledge hybridization”, and applies it to the objective of cultivating resilience among people living in mountain regions who are increasingly vulnerable to natural hazards. The ecosystems and communities of mountain regions are increasingly vulnerable to natural hazards arising from climate change and adaptations of land systems. One example is in the Koshi River Basin in Nepal. Such vulnerability exists at the intersections of environmental vagaries and human agency. This implies that there is a possibility of change if we can link different communities of knowledge, policy, and action, and allow them to work together to resolve complex problems and pursue agreed objectives. Resilience is an objective that embraces an adaptive and transformative thinking in response to non-linear dynamics of complex social-ecological systems. Such resilience thinking corresponds to a sense of human agency to make a change. Is there an effective mechanism of change for strengthening community resilience – the ability of a community and its members to adapt and thrive in changing social and ecological environments? I believe that citizen-powered ‘knowledge hybridization’ is one such mechanism. Recent advances in remote sensing and engineering geology have improved efforts to monitor, predict, prevent, and mitigate the natural hazards of mountains, such as landslides. But numerous researchers have also acknowledged the merits of traditional local knowledge and its contribution to social and ecological resilience. 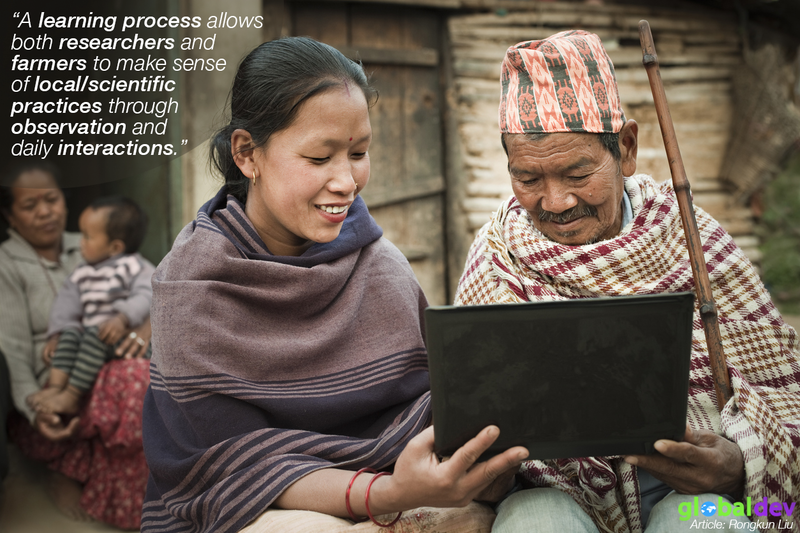 In many cases, development interventions that bring externally derived scientific knowledge and technical solutions do not engage local communities in remote mountain regions such as the Nepalese Himalayas. When engagement does happen, interventions can alienate communities if external experts and policy-makers ignore local cultural knowledge, and try to ‘fix’ problems in places that are depicted as underdeveloped. Addressing this disjuncture between local knowledge and scientific knowledge requires a broader understanding of the conditions in which the two kinds of knowledge are produced and exercised. It also requires understanding when they are compatible, and how they can be integrated through collaborative approaches to develop resilience to local, regional, and global environmental change. Knowledge hybridization might be one such mechanism towards resilience, ‘where traditional knowledge, practices, and beliefs are merged with novel forms of knowledge and technologies to create new knowledge systems’. Although hybridization implies that certain pieces of traditional knowledge – such as facts, practices, beliefs, experiences, and memories – are either replaced or endorsed by science, it is from the interplay of replacement and endorsement that the capacity of a community to regenerate and apply hybrid knowledge evolves. The interplay functions to create learning conditions in which multiple knowledge, practices, and beliefs are up for inspection and application to allow decision-making and problem-solving, new knowledge gaining, and adaptive capacity-building in response to specific social and ecological changes. The adaptive capacity built by such a process contributes to the resilience of the community. Research shows that knowledge engagement – for example, on environmental issues – can be alienating for local knowledge-holders due to a feeling of ambivalence. People have a strong need to impose consistency, coherence, and continuity on their behavior. When they are confronted with new information that doesn’t comply with their existing knowledge system, a defense mechanism will be activated by such cognitive dissonance to deny, repress, or even fabricate imaginary experiences to preserve the status quo. In this case, if strong status quo preservation is observed among the intended beneficiaries of attempted interventions, it may illustrate their ineffectiveness. This may create and require varied conditions for knowledge engagement and hybridization to help address implementation challenges associated with information asymmetry, knowledge disjuncture, and community mobilization. In this sense, social science plays a role in understanding such varied conditions and facilitating the process of knowledge hybridization. For example, ethnographic methods in anthropology and sociology have been used to investigate public engagement on environmental concerns. They have produced valuable qualitative data that illustrate what has prevented lay people from engaging on such issues. Citizen science also helps put the notion of knowledge hybridization into practice. For example, collaborative digital mapping and ‘participatory GIS’ (geographic information systems) have been suggested as effective forms of citizen science to make knowledge hybridization a reality. In these practices, professional scientists and local community members ‘co-generate’ digital and interactive maps as a result of knowledge interaction and co-production. Mainstream scientific understanding of human vulnerability can thus be paired with contextualized local knowledge that ‘integrates human adaptability with vulnerability to provide a more holistic picture’ of community resilience-building. To foster the resilience of mountain farming communities more effectively, citizen-powered knowledge hybridization, through immersive engagement and empathy with local knowledge-holders, will help to develop a fuller understanding of local agricultural decision-making processes. Such research will produce an engaging story that explores the meaning behind interactions between farmers, policy-makers, and researchers. Social scientists pay attention to the subjectivity of their research topic: the construction of meaning; what constitutes hybridization, knowledge, and ‘good and preferred’ agricultural practices; and how this may have informed the way that the researchers approach issues of environmental change, development interventions, and science engagement. When social scientists are actively involved in knowledge co-production and science engagement activities, their reflective interpretations of how their own knowledge is being informed by and merged with local knowledge are critical in evincing the process of knowledge hybridization going both ways. A learning process allows both researchers and farmers to make sense of local/scientific practices through observation and daily interactions. As more knowledge is being co-produced, the boundary between scientific and local knowledge is increasingly blurred and diluted, cradling a lived fluidity of ‘farmer-researcher/researcher-farmer’ identity. That their communication skills evolve during the process in expressing both local and scientific knowledge can therefore be regarded as an expression of knowledge hybridization where ontological dissonance is reconciled and shared meaning is co-constructed. This engaged knowledge hybridization may enable knowledge, policy, and action communities to move beyond dichotomies of ‘Western’ versus ‘Third World’, traditional versus modern, and local versus scientific, while also cultivating resilience for mountain communities. Rongkun Liu is a PhD candidate in Environmental Social Sciences at The Ohio State University. He is currently working at the International Centre for Integrated Mountain Development (ICIMOD).